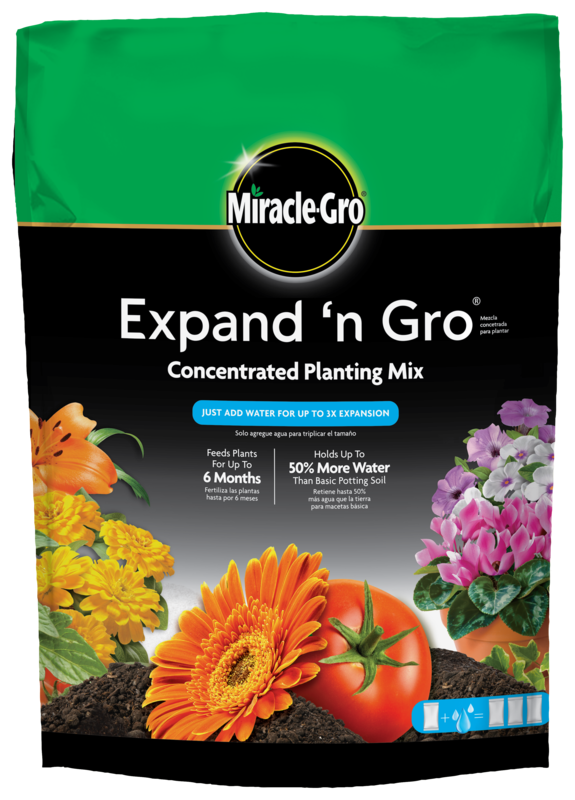 Packaged in a small, manageable, lightweight bag, Miracle-Gro® Expand 'n Gro® Concentrated Planting Mix can be delivered directly to your door making it a convenient way to get your garden project started. It makes your soil lighter and creates up to 90% more air space giving your plant's roots all the room they need to thrive. The unique expanding coir and plant food grows up to 3x when water is added and all natural fibers hold up to 50% more water than basic potting soil. Containers: Fill the container 1/3 full with Miracle-Gro® Expand 'n Gro® Concentrated Planting Mix, then gradually add water and stir for expansion. Total expansion could take up to 10 min. Plant as usual. In-ground: Spread a 1" layer of Miracle-Gro® Expand 'n Gro® Concentrated Planting Mix over the area to be planted. Mix with the top 4-6" of native soil. Plant as usual then water plants thoroughly. Raised Beds and other large projects: Mix equal parts Miracle-Gro® Expand 'n Gro® Concentrated Planting Mix and water in a separate container. Once thoroughly mixed and expanded, add the soil to the chosen bed and begin planting as usual. Dedicated to a Beautiful World: Trusted by generations of gardeners, Miracle-Gro is dedicated to helping you enhance and protect the natural beauty of your home environment. Guaranteed Satisfaction or Your Money Back! Within 6 months of purchase if you, the customer, are not completely satisfied with the results after using this product, we will refund your purchase price in full. Formulated to be lightweight and packaged to be easy to ship directly to your door. Watering Tips: Water the product on first use to ensure full expansion. After initial planting you may water as usual. Mixing Instructions: Mix with water until fully expanded. Combine Expand ‘n Gro and water in a large container. Once the water has been absorbed, add the mix to your bed and add your plants. Start by a spreading a 1” layer, then mix with the top 4-6” of your native soil and water thoroughly so the Expand ‘n Gro can live up to its name. Add Miracle-Gro Expand ‘n Gro to any container till it’s one-third full. Then add water slowly and stir. Expand ‘n Gro can can be used as a sole planting medium or incorporated into existing soil to lighten it up, add moisture retention and nutrition; and create a vastly more hospitable environment. • Expands up to 3x when you add water. • Holds up to 50% more water than ordinary potting soil. • Creates 90% more air space for explosive root growth. • Feeds for up to 6 months.